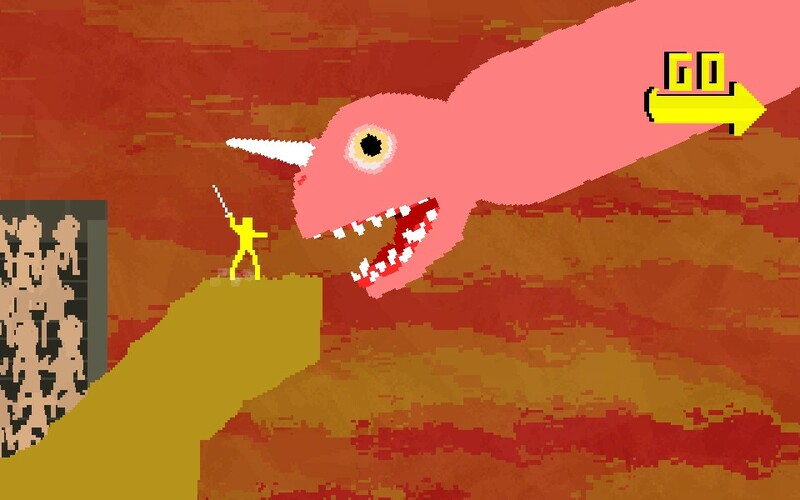 From the first moment I saw the indie fencing game Nidhogg, I knew I had to play it. There isn’t much to it really: two brightly colored, blocky figures that remotely resemble humans duel to the death with pixelated lines that kind of look like swords, all in a frantic game type that can most closely be likened to tug of war. There is a reason the game grabbed my attention immediately — I duel with swords in real-life. I started fencing around five years ago when I started my freshman year of college and since then the sport has become one of my favorite hobbies (aside from playing games and writing about them that is.) I watched the game from afar and learned more about it, and in June during the Steam Summer Sale I finally managed to pick the game up and play it for myself. It’s super fast paced, intense, and features a fantastic soundtrack. I also found that for a game about people dueling to the death for the honor of being sacrificed to a crudely drawn worm monster called the Nidhogg, Nidhogg the game actually has a surprising amount in common with real fencing and martial arts in general. Minus the Nidhogg, of course. 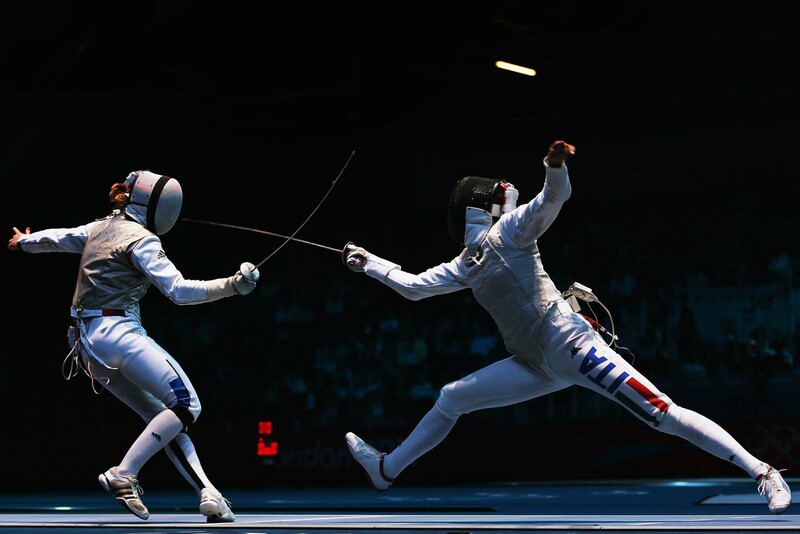 In sport fencing, two fencers duel to a specific number of points on what is called a “strip.” The strip is basically a narrow playing field where the duel will take place. You can move forward, back, and slightly to the left or right. Depending on what weapon you are using the rules are different, but for epee, the type of fencing that most resembles actual dueling, you can stab your opponent anywhere and receive a point. In foil fencing players earn points only by hitting the chest and having what is called “right of way,” which is basically a way to determine who will receive a point if two attacks land at the same time. The objective in Nidhogg is a little different, but along the way does manage to incorporate many of the rules of actual fencing. 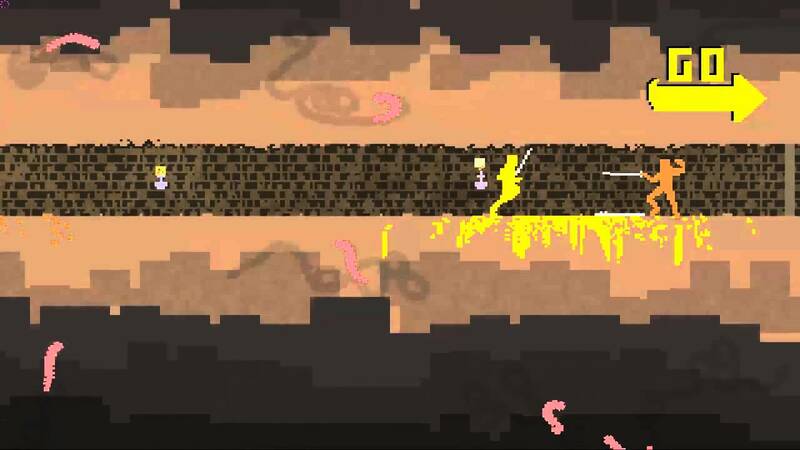 In Nidhogg, one player needs to run all the way to the right of the level to win, while the other needs to run all the way to the left. The map is symmetrical, and both players start in the middle of the arena. Killing the other player grants the winner “right of way,” which allows them to run and progress to the next screen, with the eventual goal of running far enough in their respective direction to win. The only catch is your opponent will respawn shortly after death in your path, requiring you to defeat them again. If they defeat you instead, they are granted right of way and can progress in their respective direction, essentially erasing your progress and creating a game of deadly tug of war. Watching the game in action will give you a much better understanding — it sounds kind of complicated, but in practice it is painfully simple. Like in actual fencing, duelists in Nidhogg are restricted to a 2D plane not so different from a fencing strip. You can move forward and back but not to the side. While in sport fencing you can jump and duck, because in Nidhogg the actual objective is to get past your opponent and run to the end of the level, you can actually jump or roll past your opponent and make a mad dash for the objective. This is likely to get you killed, as players can also hurl their blades through the air in Nidhogg, something that as you can probably guess is illegal in actual fencing. Players can also punch their opponent if they happen to lose their sword and even sweep kick their opponent off their feet before killing them and taking their weapon. So you know, Nidhogg is basically real fencing. When it comes down to it, fencing is really all about three things: distance, timing, and reading your opponent. Speed comes in at a close fourth, but without understanding the first three and putting them into good practice, speed won’t get you very far. Each of these essentials for being a better fencer just so happen to have a place in a game about virtual fencing as well. First up is distance. Distance in fencing is everything. Distance is knowing when you can hit your opponent, knowing when they can hit you, knowing how many steps you need to take to be able to make that critical lunge, and knowing how long it will take for your point to hit its mark. Without a good understanding of distance, you will find yourself on the end of your opponents point far more often than you would like. This applies in Nidhogg as well. Unless you are running the opposite direction, players always have their sword tips pointed towards their opponent in Nidhogg, and can raise or lower the level of their point. Depending on the height of your weapon, the longer or shorter your lunge distance (attack) is. If your opponents blade occupies the same height as yours when you attack, your blades will bounce off one another. 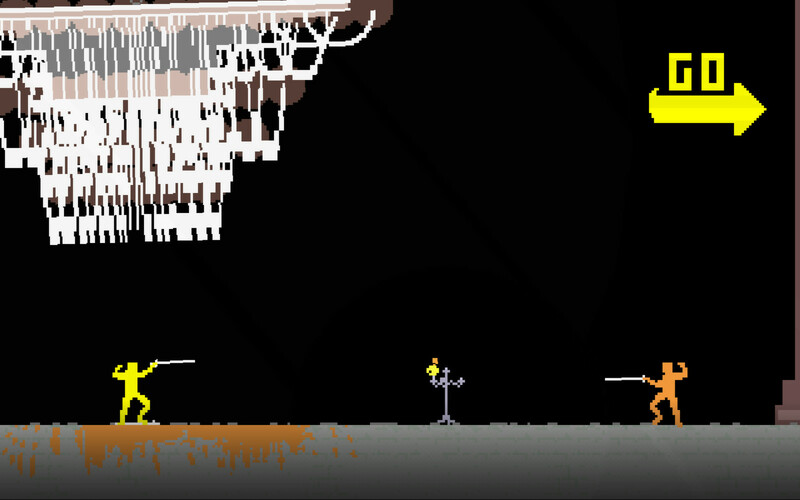 Knowing when your opponent can hit you at any given time is critical in Nidhogg. If your blade is high and your opponent’s is low, you have to know who has the longer reach or else you will wind up bleeding neon orange blood all over the stone tiles. Unlike in real fencing, in Nidhogg players can run forward and backward as well as jump and roll, which opens up more possibilities for setting up your distance and striking when the time is right. That brings us to our next important factor — timing. Timing is basically just that, and is hard to exactly train for. You just have to be able to see the opportunity and take it, going all in on pure reflex and gut reaction. The moment you see your opponent flinch, lower their blade, or take a moment of relaxation, you have to be ready to spring that instant. Wait even just a second and the moment will be gone, along with your opportunity for victory. Nidhogg is no different. In the game you can disarm your opponent by having the tip of your blade half way past the tip of theirs, and then moving your blade either down to land on top of their weapon or coming from under and hitting their sword up to perform what we in fencing would call a “beat attack.” In Nidhogg it is a disarm, and gives you the perfect opportunity to strike. Timing, however, is essential. Moving your blade far enough in to perform the disarm isn’t easy, especially when your opponent can simply lunge and stab you at any moment, made all the easier the closer to them you are. The perfect time to disarm then is to wait for your opponent to lunge, allowing them to bring their sword to you, and then disarming them before their sword point finds its mark. This requires excellent timing and a little bit of anticipation. Hesitate for even a moment or misread your distance and you are done for. Reading your opponent is by far the hardest ability for any fencer to learn, and you never stop learning. Every opponent is different, and it is a constant challenge to keep up. As one of my fencing instructor’s likes to say, fencing is like playing an extremely physical game of chess. You have to always think a couple of steps ahead. If I do this, what will they do? What if I do this instead? To succeed, you need to be able to anticipate your opponents actions and be able to understand what his or her reaction might be to any given attack, all while trying to not get stabbed. By knowing those reactions, you can further set up your opponent to put them right where you want them. This is where gauging your opponents defenses and baiting them come into play. By doing attacks never meant to hit their target, you can see what your opponent does and adapt. By presenting yourself as a target, you can invoke an attack from your opponent, and as long as you are expecting it and are fast enough, can turn their attack into one of your own. These tactics work just as well in Nidhogg. Knowing that if you turn your back and run your opponent may hurl their sword at you gives you an advantage. As long as you are fast enough to dodge the weapon, you can then quickly turn the tables on your unarmed opponent. Knowing your opponent likes to lunge high whenever your blade is low gives you a similar piece of vital information. By knowing what your opponents habits and strategies are, you can adapt and take advantage of them. While these aspects of fencing apply especially well to Nidhogg due to the dueling inspired nature of the game, timing, distance and the ability to read your opponent can be applied to any fighting game. In this way games really do imitate life. While specific skills or techniques from martial arts don’t carry over to the virtual world, the knowledge and understanding of the concepts do. Professional fighting game players exhibit an extraordinary understanding of distance, knowing exactly how far they need to be in order to land a hit at its maximum range. They show an incredible sense of timing, having memorized the exact number of animation frames any given attack in the game takes and the time associated with it. They know when their opponent makes a mistake, and they don’t hesitate to jump on the opportunity and turn a game in their favor. They know how to make their opponent react and anticipate those reactions to come out on top. In spirit and in concept, virtual duels and fights are not much different from ones in real life. They take the same kind of discipline, knowledge, and practice as any martial art in the real world does. Games just sometimes have giant unicorn worms that swallow you whole after you win.